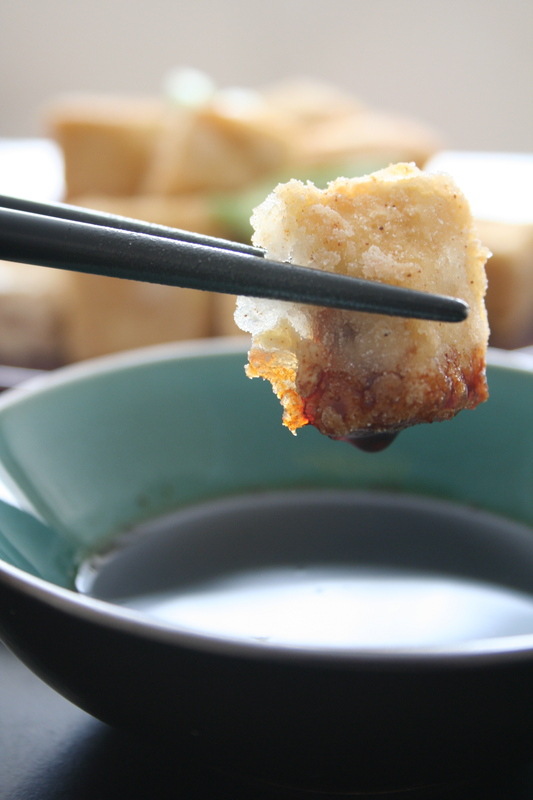 This weekend we had a load of tofu that needed using up quickly. Normally we’d whip up a Thai curry but as there was no Thai curry paste in the house it seemed like a good opportunity to try something new. Tofu is not known as a flavourful ingredient and consequently many tofu recipes call for a list of spices as long as your arm. I really didn’t feel like making anything too complicated, so I started searching for something simple. 1. Drain the tofu well to remove any excess moisture. Use some kitchen paper and a clean tea towel to absorb excess liquid. I often place my block of tofu between two chopping boards and add a weight on top to help squeeze out the water. 2. 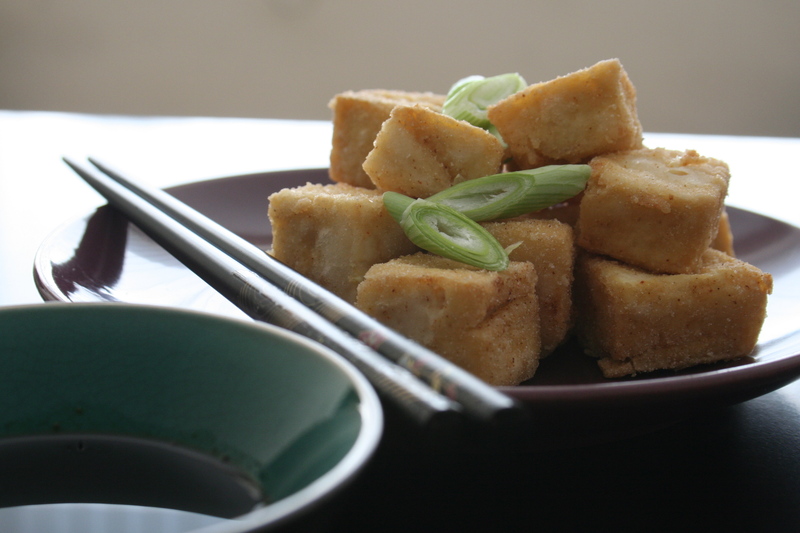 Cut the tofu into bitesized pieces. 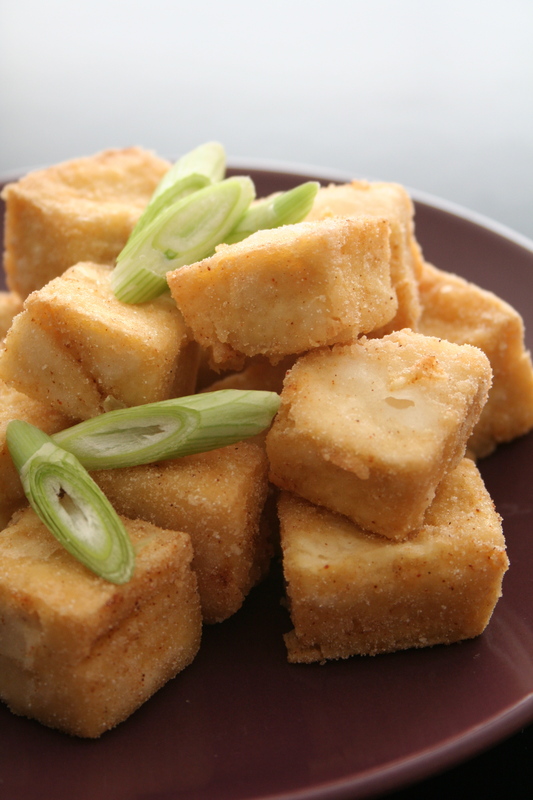 Mix the rice flour with a little chilli powder in a large bowl, then toss in the tofu cubes and shake to ensure that they are well coated with flour. 3. Heat oil either in a deep fryer or a large saucepan – you only need enough to just cover the cubes. We put ours in the deep fryer for 4 minutes. If using a pan, make sure that you turn the cubes occasionally so that all sides are browned. Remove from the oil and place on kitchen paper to absorb excess oil. 1. Add all the ingredients to a small saucepan and simmer for about 5 minutes to cook off the alcohol. I strained mine before serving, but this is not essential. ~ by smileysoyabean on 24 June 2012.